This article is the last part of the analysis of the Re150 GreHack 2015 challenge. It will focus on how to re-assemble a cleaned up version of this challenge using Miasm. For references, please have a look at GreHack 2015 Re150 challenge: as painless as possible. This analysis is based on Miasm revision 4eceb2b. In the previous article, a recurrent deciphering pattern has been identified. As we first want to retrieve every basic block (in order to clean and re-assemble them), we need to pass through these patterns. a valid input to reach this path is needed. We could find several inputs (actually, three) which trigger different execution paths, execute them and merge resulting control flow graphes. To introduce other Miasm APIs, and because this solution looks better in my mind, we will instead instrument the disassembly engine to partially execute deciphering patterns as they appear. This way, new patterns will appear and will be “resolved” on the fly. In addition, if two branches contain the pattern, they will both be explored - there is no need for a specific input. We will base our script on the standard, already detailed, disassembly code snippet. In order to instrument the disassembly engine, we will register a callback. This mechanism is illustrated in the example example/disasm/callback.py. For this purpose, we declare the global to_exec, a dictionary associating the pattern’s end block address with the corresponding head block address. Indeed, the first block is 5-line long. Before being the one we know, it needs to be split due to its final jump inside itself (see blocks.apply_splitting method for more details). That’s why the first time we encounter it, it is 5-line long and its direct successor (next constraint, the address when the jump is ignored) is the pattern’s end block. Thus, we can register it in to_exec. To execute the pattern, we use an ELF Sandbox. First, we need to link our fresh work with the Sandbox, in order to work on the same memory instance. For instance, there is jump to 0xf51a21ad. Actually, the disassembly engine should stop after the block 0x804b270: it’s a syscall to sys_exit. We can tell the engine to stop when an INT 0x80 is hit, but doing this, we will actually stop after an earlier call to sys_write. At this stage, we have the full CFG, without any extra blocks. But we still have our patterns. As before (see part 1), we will use MatchGraph to remove the patterns. But this time, we also patch jump offsets to keep assembler consistency: when linking a pattern’s predecessors with its successors, if the predecessor ends with a jump, set its destination to the successor label. jump offsets are valid, effectively pointing to their successors. Let’s rebuild a cleaned up and working binary! as we do not care anymore about the previous code, we can override it. To illustrate the Miasm API, we arbitrarily choose the second option. Address intervals used by overridable blocks can be obtained through block.get_range(). We use a Miasm utils, miasm2.core.interval::interval, which stands for a set of non-overlapping integer interval. There are a few gaps between our range, composed of useless bytes: we will use the hull of these intervals. Fortunately, Miasm knows how to deal with this kind of constraints. Think about a board with clusters of sticky-notes. You can move a whole cluster only by moving one of the sticky notes (-> pinning it to an absolute coordinate) and the rest of notes will follow accordingly (-> “next” constraints). 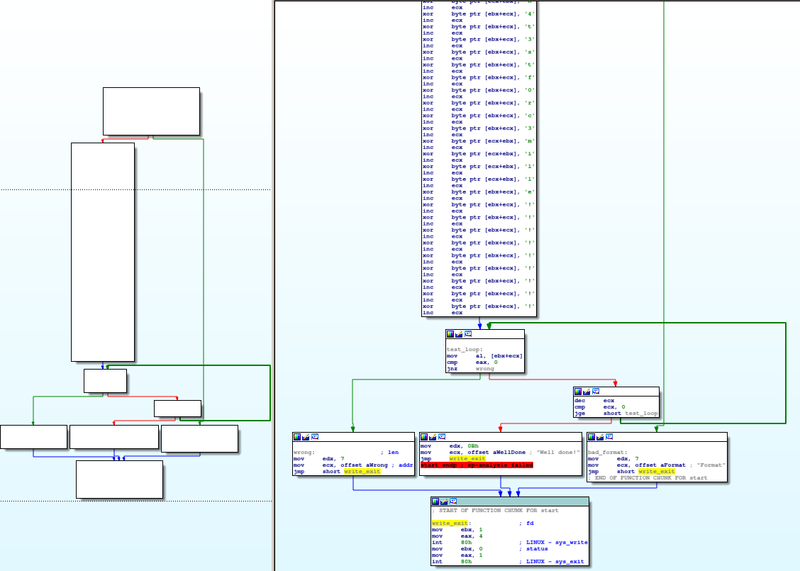 The resulting patches dictionary associates an offset to the corresponding assembled bytes. For instance, patches[0x8048081] = '\xbb\x01\x00\x00\x00'. $ ./reverseMe "You know nothing, JS"
$ ./reverseMe_clean.bin "You know nothing, JS"
Without going to deep in the details, we can easily ask Miasm to solve the challenge for us using Microsoft z3, a SMT solver. A future article will be fully dedicated to interaction between Miasm and SMT solvers, so this is only a teaser. Our script will try to reach every basic block at least one time, and generate valid input for each of them. This is similar (and way more naive) to what Triton / KLEE / Angr / … are doing. A script doing this is already present in examples (expression/solve_condition_stp.py) but here, we write a simpler version based on z3. Our algorithm will take a state in input, check its satisfiability and generate n states for each of available successors. The initial state is the state at the entry point. We define a custom ExprId, arg1, which is an alias on the input (for readability). The magic will be operating through translators (miasm2.ir.translators, example/expression/expr_translate.py) which translate a Miasm IR element to something. If we reached a sys_exit, SbExecStopINT will return False. This is maybe the expected solution. """Retrieve the input character number @idx of solution @model"""
# Solution found if message is "Well done!" REACH INT, message: Well done! Through this article, we have used Miasm to deobfuscate a (simple) binary to a new one, fixed and still working. As this is only a toy example, one can easily imagine applying this kind of algorithm on real world cases, to simplify a binary for further analysis. That way, this step is “independent”, outputting a working binary processable by other tools. In addition, as Miasm doesn’t rely on external tool for disassembling / assembling, these processes are applicable on custom architectures. One can also imagine writing a tiny packer based on Miasm. Finally, we just start to play with SMT solvers; there are very powerful (and fashionable) tools, so be sure we will use them again!